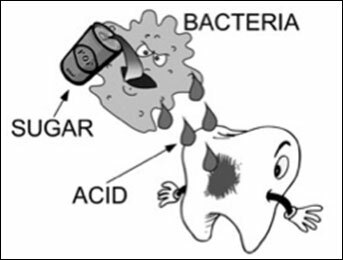 Tooth decay is caused by acid-producing bacteria that live in your mouth. The bacteria feed on what you eat, especially sugars. Within just a few minutes after you eat, or drink, the bacteria begin producing acids as a by- product of their digesting your food. Those acids can penetrate and dissolve the minerals (calcium and phosphate) in your teeth. If the acid attacks are infrequent and of short duration, your saliva can help to repair the damage by neutralizing the acids and supplying minerals and fluoride that can replace those lost from the tooth. However if: (i) your mouth is dry, (ii) you have too much acid exposure, or (iii) you snack frequently, then the tooth mineral lost by attacks of acids is too great and cannot be repaired. This is the start of tooth decay and leads to cavities. Improving diet by reducing the number of sugary foods, snacks, drinks, or candies can help reduce the development of tooth decay. The instant 'lift' we get from sugar is one of the reasons we turn to it at times of celebration or when we crave comfort and reward. However, even those of us without a sweet tooth may be eating more than we realize because so many everyday, processed foods, from cereals and bread to pasta sauce and soups contain sugar. That does not mean you can never eat these types of foods, but you should limit their consumption particularly when eaten between main meals. It is important to distinguish between natural sugars and added sugars. Sugars naturally occurring in fruits, vegetables and dairy are Okay but sugars removed from their original source and ADDED to foods, we need to be wary of. The sugars in fruit are encased in fibers and therefore are broken down slower. There are over 60 different names for added sugar that the food industry uses to hide “added sugars”. The other important point to understand is around a natural sugar found in dairy products called LACTOSE. Plain Milk will have a fair bit of sugar in it, which is the lactose. However flavored milk will have the added sugars in it that we need to avoid. This also applies to yoghurt. The naturally occurring lactose in yoghurt is around 1 teaspoon per 100 grams, so any more sugar than that is going to be the added sugar that the WHO is referring to. The WHO recommends only 6 teaspoons (24grs) of added sugar a/day. 1 teaspoon of sugars is 4grs. There is a great website called www.thatsugarfilm.com which goes into explaining added sugars more. Know your substitutes - for example xylitol, sorbitol and mannitol. These occur naturally in small amounts in plants and fruits and are often used in low-calorie products to provide sweetness but with fewer calories. Xylitol can be used in home-baking as a replacement for regular sugar (ratio 1:1) although it won't brown as much and it can't be used where yeast is the raising agent. Reduce the sugar frequency by decreasing the sugar in your snacks between main main meals. If you have to snack the best foods are savoury such as: raw carrots, cucumber, celery and peppers, chunk of cheese, plain cheese biscuit such as oat cakes, bread sticks, rice cakes.This will give a chance to your teeth to recover. Be wary of 'sugar-free' foods. These often contain synthetic sweeteners like sucralose, saccharin and aspartame. Although these taste sweet, they don't help curb a sweet tooth so they tend to send confusing messages to the brain, which can lead to overeating. Balance your carb intake with lean protein like fish, chicken and turkey - protein foods slow stomach emptying, which helps manage cravings. Swap white bread, rice and pasta for whole grain versions like oats, granary and wholemeal breads, brown rice and pasta. Reduce the sugar in recipes and add spices to boost flavour and taste. Stick to one glass of fruit juice a day (or dilute it) and keep sweet soft drinks and alcohol for the weekends. Enjoy herbal teas or water with slices of citrus fruits. For a pick me up, have a piece of whole fruit with a handful of nuts or a small tub of plain yogurt. Both contain protein which helps balance blood sugar and energy levels. Saliva is critical for controlling tooth decay. It neutralizes acids and provides minerals and proteins that protect the teeth. If you cannot brush after a meal or snack, you can rinse or chew some sugar- free gum. This will stimulate the flow of saliva to help neutralize acids and bring lost minerals back to the teeth. Sugar-free candy or mints could also be used, but some of these contain acids themselves. These acids will not cause tooth decay, but they can slowly dissolve the enamel surface directly over time (a process called erosion). Some sugar-free gums are designed to help fight tooth decay and are particularly useful if you have a dry mouth (many medications can cause a dry mouth). Some gums contain baking soda that neutralizes the acids produced by the bacteria in plaque. Sealants are plastic or glass ionomer coatings bonded to the biting surfaces of back teeth to protect the deep grooves from decay. In some people, the grooves on the surfaces of the teeth are too narrow and deep to clean with a toothbrush, so they may decay in spite of your best efforts. Sealants are an excellent preventive measure used for children and young adults at risk for this type of decay. They do not last forever and should be inspected once a year and replaced if needed. bad bacteria that cause tooth decay and can be useful in patients at high risk for tooth decay. Fluorides help to make the tooth more resistant to being dissolved by the bacterial acids. Fluorides are available from a variety of sources such as drinking water, toothpaste, over-the-counter rinses, and products prescribed by your dentist such as brush-on gels or high-fluoride toothpastes used at home or gels, foams, and varnishes applied in the dental office. Daily use is very important to help protect against the acid attacks. Calcium and phosphate at the proper pH is necessary for tooth repair. Normally, this is carried out by your saliva but when you have a lack of saliva (dry mouth) or when fluoride alone is not effective, you may consider supplementing with calcium/phosphate and acid-neutralizing products. Removing the plaque from your teeth on a daily basis is helpful in controlling tooth decay. Plaque can be difficult to remove from some parts of your mouth especially between the teeth and in grooves on the biting surfaces of back teeth. If you have an appliance such as an orthodontic retainer or partial denture, remove it before brushing your teeth. Brush all surfaces of the appliance also.